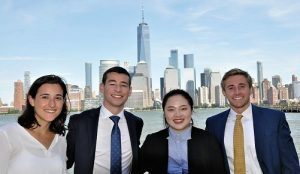 Summertime is here and WallachBeth Capital is proud to welcome four rising stars to our WallachBeth Summer Internship Program 2018. Each summer we look forward to actively mentoring motivated youths who want to explore career opportunities in the financial industry. A combination of assignments, mentorship, investment pitches and some friendly competitions, our internship program is a fully immersive experience designed to give interns exposure to all business areas of the firm. We are thrilled to have them join the team for the summer and value their contributions to the firm!